On March 17, 1999, the website Resources for LDS Organists was launched by DeeAnn Stone. The site’s purpose was to be a place where organists could find help in planning their music for church services, using a list posted there of available hymn arrangements and accompaniments that DeeAnn began to compile in 1993. The site now has many more resources and helps added to it. To observe the website’s 20th anniversary, DeeAnn has made extensive revisions, additions, corrections, and updates to the booklet she offers at the website called a “Resource List for Organists: Arrangements and Accompaniments for Hymns in the LDS Hymnal.” What started out as a 20-page booklet in 1993 has now become a whopping 459-page eBook, with hundreds of new titles of hymn arrangements and accompaniments. Each title is linked to the publisher or distributor of the books the titles are found in, plus there are internal links to help navigate the eBook. 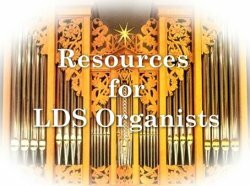 While at Resources for LDS Organists, be sure to check out the new links to very informative videos created by the National AGO to aid new organists in learning how to play the organ, as well as other helpful and interesting videos from other sources. There’s also other information at the website that would help organ students and new ward organists (and there are even helps for Primary Music Directors). Enjoy! Please contact us at: gro.o1556214260gavu@1556214260ofni1556214260. We will be happy to assist you.